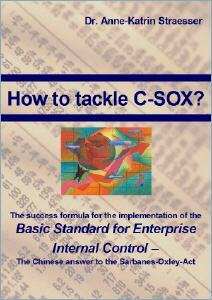 a Proven Success Formula to Implement C-SOX Easily and Gain Competitive Edge? As for most companies the requirements of the Basic Standard for Enterprise Internal Control and the time pressure to be compliant by the end of the year may seem overwhelming, there are a few simple steps you can take not only to become compliant quicker and with less cost you ever thought but also gain competitive edge. Based on the experience of implementing and auditing several companies’ internal control systems, such as the US SOX, the book "How to tackle C-SOX" reveals a success formula to easily and cost-effectively comply with the new Standard in a short period of time. This book not only explains methods Big4 firms use when implementing an internal control system but also ways how you can cut on auditing and consulting fees and improve your entire organisation. The book “How to tackle C-SOX” gives you step-by-step information how you can implement the whole system while using minimum resources. No matter, whether your role is CEO, Controller, Finance Director, Accountant or Consultant, this knowledge will you put ahead of your peers. It shows you how you can utilise what is readily available in the company and how to leverage it in order to self-assess the internal control system and be compliant with C-SOX. In a 5-step Proven Success Formula you learn exactly what you need to do in order to achieve compliancy and gain competitive edge. What are the steps that ensure you need to take until the end of the year so your company complies with the Standard and is ahead of your competitors? The book explains all the in detail. It guides you through the various actions and provides you with the necessary material to easily follow-through. You receive step by step instructions for each of the project phases. You also receive loads of hands-on material, like checklists for all significant processes. From focussing on the important issues over forming the optimum project team to writing a self-assessment report and communicate to external auditors this book contains a lot of insider knowledge. - Avoid mistakes that a lot of companies and people without the knowledge of the book are probably going to make. The book reveals best practices from several years experience in the work of internal control systems. It tells you what works and what doesn’t, where the big traps are and how to get around them and foremost: How to become compliant without spending a vast amount of money. The section deals with common and mostly quite costly mistakes that have been made in former compliance projects. If you learn from those, avoid them and use this knowledge you are able to stay ahead of your competitors and improve profitability. As an old Chinese saying by Fan Li says: "Give a fish to a man; he has food for a day. Teach a man to fish; he learns a skill for life." This book is giving away the information and knowledge that usually resides with large consulting and accounting firms. "How to tackle C-SOX" is going to be published in print in a few weeks. However, due to the urgent demand of information and clarifications in relation to the Standard, the book is available for you right now in a electronic version. This ensures you are ahead of your competitors and are able to apply this knowledge right away. The investment for the book is normally 97€ which is less than one hour consulting fee. NOW FOR ONLY A SHORT PERIOD OF TIME we sell it for 47 €. The book is in a printable pdf-format and will be available for download in just a few seconds after the purchase. With the purchase of the eBook we include special bonuses. However, we guarantee these bonuses only for the first days of selling. The value of these bonuses alone adds up to over 1.500 € worth of consulting fees! I wish you every sucess with the information and your C-SOX project. PS: Purchase today if you want to be sure to secure these valuable bonues as this offer is only guaranteed for a short period of time.